to appeal to Atiku Abubakar, the presidential candidate of Peoples Democratic Party, PDP, in the last election to congratulate his opponent, Muhammadu Buhari of the All Progressives Congress to concede defeat. The Independent National Electoral Commission had declared Buhari of the APC winner of the keenly contested having scored the highest votes. However, Atiku has vowed to go to court, alleging that he was rigged. 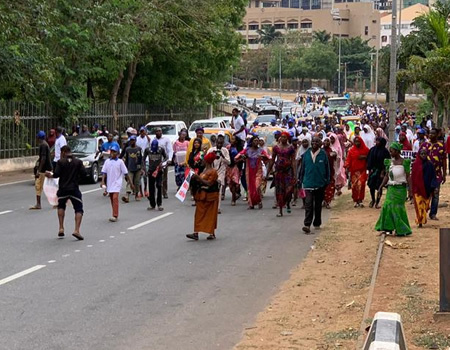 The women, under the aegis of Two Million Woman Rally for Democracy in Nigeria, Peace and Stability, kick-started their match at the Unity Fountain down to Hilton Area before proceeding to the Force headquarters, Eagle Square and back to Unity Fountain. They called on Atiku to emulate former President Goodluck Jonathan and congratulate Buhari. Speaking during the rally, the convener, Mary Onuche, called on Atiku to save Nigeria from anarchy and embrace his brother. Onuche also called on Buhari not to disappoint Nigerians who have overwhelmingly voted him for another term. "Once again, we want to appeal to our father and friend, Alhaji Atiku Abubakar to do the needful now. Pick up the phone and call President Buhari, let’s sustain the peace and stability of our nation."